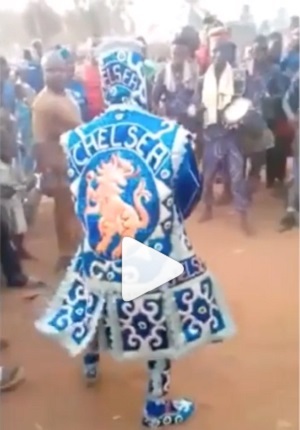 Many people have been left surprised after spotting two Chelsea fc masquerades parading and dancing in Nigeria. Two masquerades donning the blue colours of Chelsea Football club have been spotted dancing happily to entertain people in Nigeria. The masquerades with Chelsea FC boldly written on their attires showed off their dance moves as people cheered. It is believed those present during the parade are supporters of Chelsea Football club in Nigeria as they used the opportunity to enjoy themselves.